I’m so excited to be a part of Brooke McGlothlin’s Gospel Centered Mom book tour! This post was inspired by the book Gospel Centered Mom. I would recommend Gospel Centered Mom to any mom who needs to be reminded of her purpose. 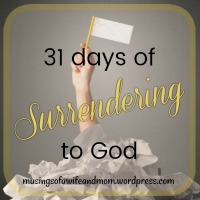 According to the Westminster Catechism, “Man’s chief end is to glorify God, and to enjoy him forever.” As a mom, I want that to be my goal also, and in Gospel Centered Mom, Brooke shares scripture and encouragement that reminds moms to keep their focus on God, even on the hardest days of motherhood. I am so thankful that I do have to be enough for my children, and that God’s grace is enough for my children and me. It is so amazing to realize that He can use my flaws and failures to bring Him glory as I live my life surrendered to Him. You are the Queen of book reviews – you do such a great job! I am extroverted bookworm. So, I love talking and writing about really good books. I am so thankful to you and Brooke for giving me the opportunity to be on your launch teams. I have enjoyed it so much. LOVE this… and it sounds like such a great book and resource for Moms! Yes, and you don’t know how much I beat myself up for not being “good enough.” The truth that I was not designed to be good enough, that I was made to need Jesus, is so freeing. I will be preaching this to myself on the hard days from now on.